The Breakdown: Do Negative Campaign Ads Sway Voters? With attack ads battling it out on airwaves across the country, Chris Hayes asks Stanford professor Shanto Iyengar: do negative ads ever have positive effects? With candidates' campaign ads battling it out on the airwaves and on our TV screens leading up to next week's elections, Chris Hayes and Stanford professor Shanto Iyengar get to the bottom of whether negative ads ever have positive effects. With days to go until the midterm elections and with buckets of money being poured into this year’s races, negative campaign ads are battling it out on airwaves and on TV screens across the country. But are these smear campaigns actually beneficial to the candidates who fund them? Do they leave a lasting impression in voters’ minds or just a bad taste in their mouths? And if they do work in swaying voters, why? 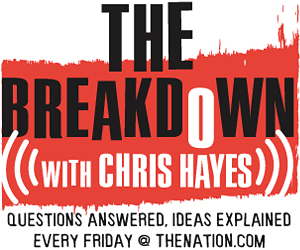 On this week’s edition of The Breakdown, Stanford political science professor Shanto Iyengar joins The Nation‘s DC editor Chris Hayes to figure out whether negative ads ever have positive effects. Matt Lauer asking Meg Whitman and Jerry Brown to just get along. A round-up of the worst negative campaign ads from this year’s primaries. More information about guest Shanto Iyengar.